It’s nearly here! Summertime, I mean. Summer vacation. All hail! 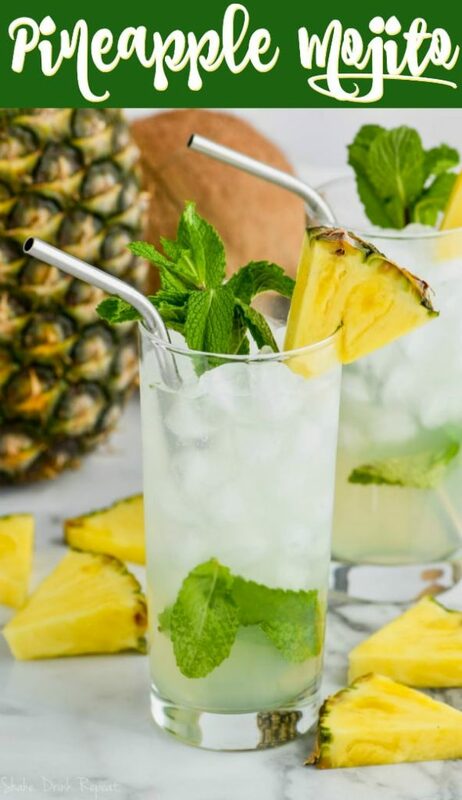 And while physically I’m still going through the motions of making school lunches and checking math facts, mentally I’m on a beach somewhere with a cocktail in my hand, preferably this deliciously sweet Pineapple Mojito. Part Mojito, part Piña Colada, it’s like magic potion to keep you hanging on all through summer. 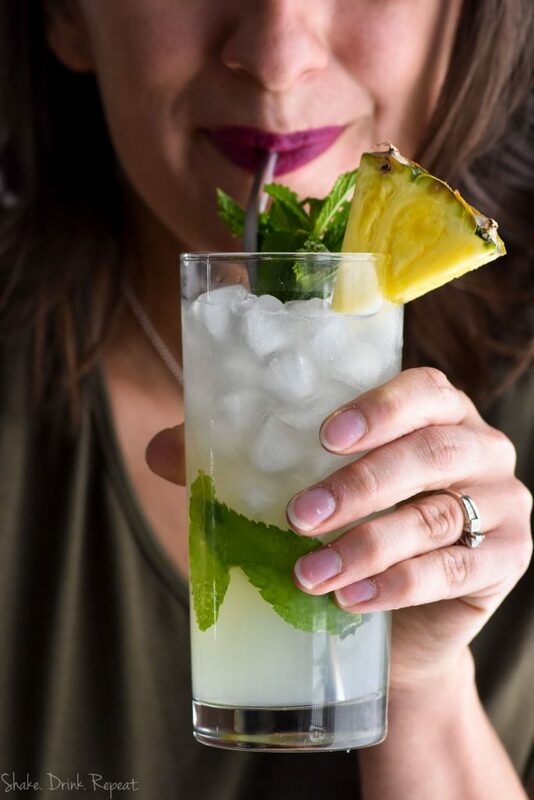 Just like the name implies, Pineapple Mojito is a tropical twist on the classic mojito. 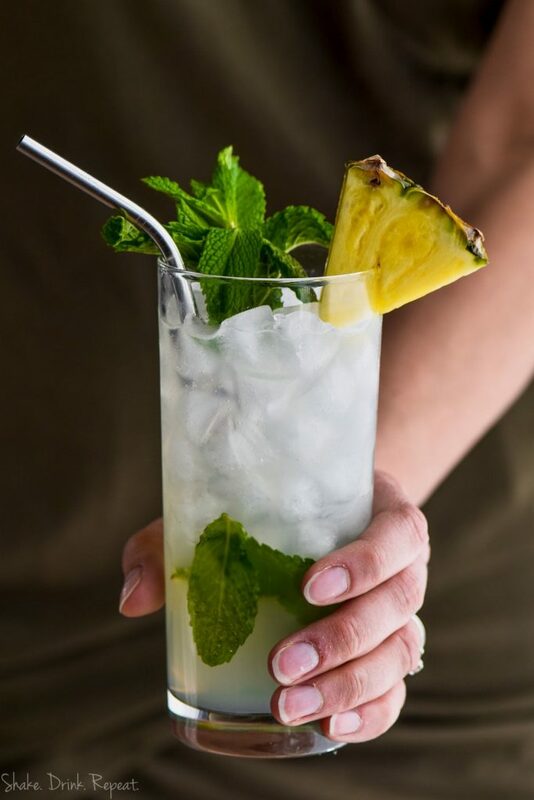 Refreshing pineapple juice, combined with my easy Simple Syrup recipe, mint and lime makes this mojito one of the most fragrant and flavorful cocktails I’ve ever created! And if you’re a pineapple fan like I am, you’ve got to try this Dole Whip with Rum or this Tequila Pineapple Punch. 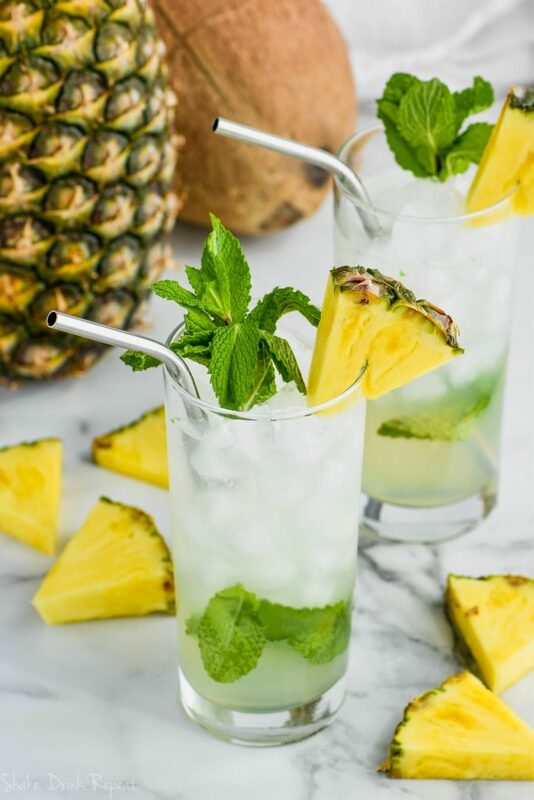 WHAT DO I NEED TO MAKE A PINEAPPLE MOJITO? 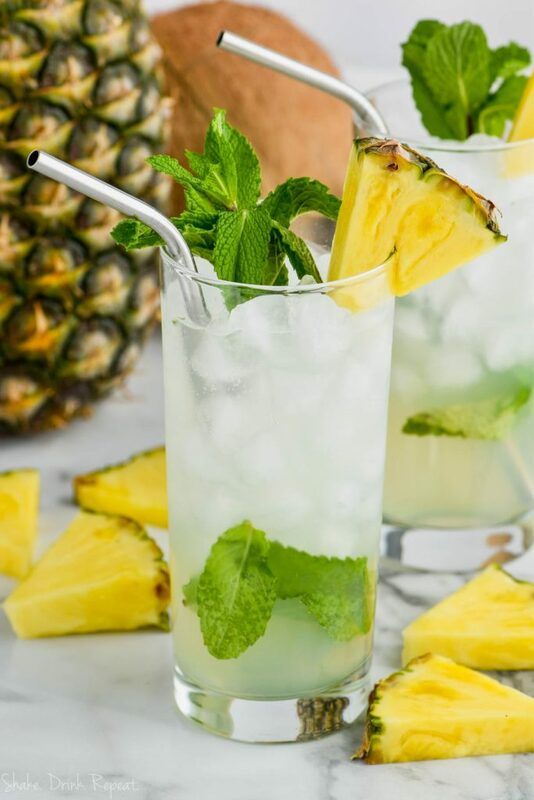 This pineapple mojito with simple syrup actually incorporates pineapple juice, rather than fresh pineapple. It’s easier to prepare in a pinch, although you could certainly chop and juice the fresh fruit too. You’ll need a good quality coconut rum (Bacardi makes a nice one!). It also makes to-die-for Coconut Rum Mojitos and Pina Colada Rum Punch. Make sure to have plenty of fresh mint leaves, lime juice and club soda on hand to round out this recipe. In a high ball glass, combine mint leaves, lime juice and the simple syrup. Using a muddler or the end of a wooden spoon, muddle those ingredients together. Then add in a couple ounces each of pineapple juice, Bacardi coconut rum, and club soda. Needing more tropical treasures for your summertime sipping? Try this green Midori Splice or this tangy Mango Mojito. 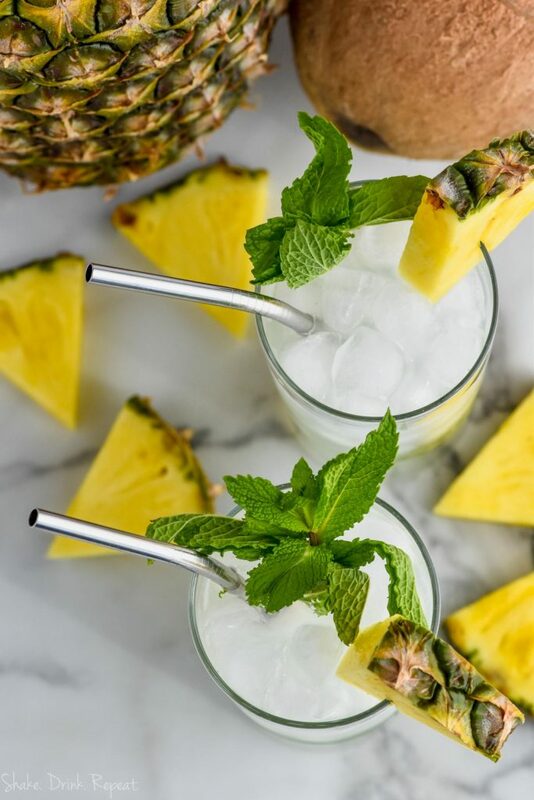 It's like a Pina Colada and a Mojito had a fantastic baby with this amazing Pineapple Mojito! This recipe comes together so fast and is the amazing tropical cocktail you are looking for! In a high ball glass, muddle together the mint leaves, simple syrup, and lime juice.